Stage and screen star Maureen Lipman is to return to perform at the Edinburgh Festival Fringe for the first time since she made her debut at the event as an unknown performer more than half a century ago. The 72-year-old, whose career has included Coronation Street, Casualty, Doctor Who, Skins and Jonathan Creek, will be hosting her own cabaret show at the George Square Theatre in August. Lipman appeared in the Kerry Lee Crabbe play The Burn at the Fringe in 1965 - a decade before she became a household name in sitcoms like The Lovers and Doctor at Large. She has worked with Laurence Olivier, Alec Guinness, Diana Rigg, Roman Polanski and Julie Walters during her career, which includes film appearances in Educating Rita and The Pianist. Lipman - who has promised “music, musings, monologues, magic and a little mayhem” in her show - will perform alongside the jazz singer Jacqui Dankworth and her musician husband Charlie Wood. Lipman said: “I last played the Fringe 53 years ago and I can finally afford to come back. Meanwhile Australian star Jason Donovan will be exploring the highs and lows of his own long-running stage and screen career in another show in the Assembly Festival line-up. The 49-year-old, who shot to fame starring alongside Kylie Minogue in Neighbours, is part of the Assembly line-up which will see Simon Callow star in a new adaptation of Oscar Wilde’s De Profundis. 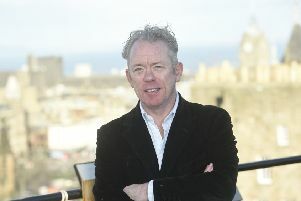 Gilded Balloon has announced that Scottish comedy favourite Jack Docherty will be reviving his classic Absolutely character McGlashan and his current incarnation as Chief Inspector Miekelson from Scot Squad. Another former Coronation Street star, Julie Hesmondhalgh, will be performing in a one-woman play at the Fringe. The actress, who played Hayley Cropper in the soap for 16 years, is starring in the love story The Greatest Play in the History of the World, part of the Traverse Theatre line-up. It also features another one-woman play, One The Exhale, which will explore the rising tide of school shootings and gun violence in the United States. Ulster American will tackle issues surround abuses of power and Irish cultural identity, while Class is billed as an “explosive exploration of class as a parent-teacher meeting goes spectacularly awry.